….The string ensemble of the Midlands. A string quartet and string trio specialising in modern wedding music covering Nottingham, Derby, Leicester, Birmingham, Warwick, Northampton and parts of Staffordshire, Lincolnshire and South Yorkshire with fees from £450-£870 (£365-£690 for the trio). We perform a few ‘Hear us Live’ events each year so keep an eye on our website and our Facebook page for more details. To find out more / discuss a booking click here to email Sarah. Why book Highly Strung Quartet? The Highly Strung String Quartet is one of the most renowned quartets in the Midlands. This all female string ensemble has over 18 years experience of playing at weddings and corporate functions. 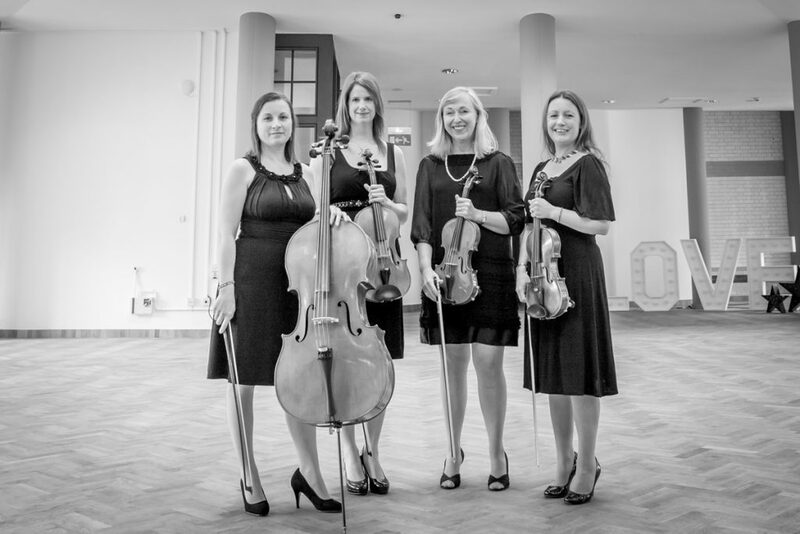 Highly Strung is a professional, vibrant string quartet with an eclectic playlist mixing classical music with lighter numbers, jazz and popular repertoire. The quartet’s versatile and entertaining repertoire includes music to suit any occasion – from Bach, Beethoven and Bacharach to Rihanna, Adele, Snow Patrol and the Killers! The string quartet is extremely popular at wedding ceremonies and receptions, civil partnership ceremonies, society dinners, parties, balls, art exhibitions, product launches and corporate events. The ‘Highly Strung String Quartet’ was formed in the Midlands in 1997 and the players have all studied at the top music conservatoires in England; the Royal Northern College of Music, the Royal College of Music and the Royal Birmingham Conservatoire of Music. The string quartet has a huge profile in Nottinghamshire and the Midlands. 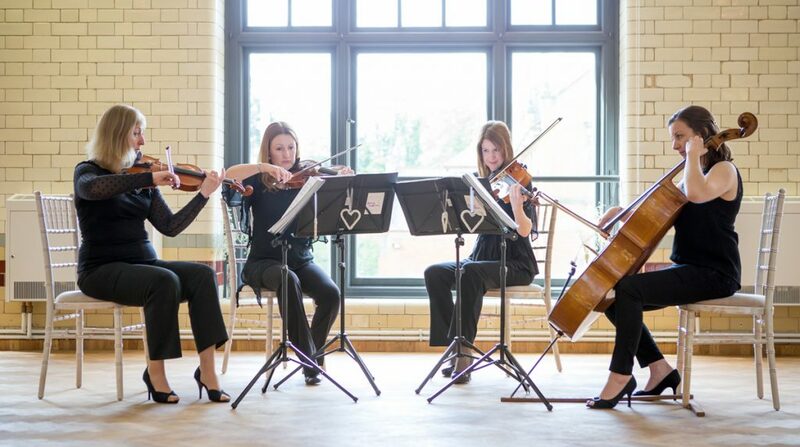 The string quartet has played at weddings and corporate functions in some of the country’s finest venues including Belvoir Castle, Chatsworth House, Burghley House and Wroxhall Abbey. They have played for weddings on Guernsey and in France, for a corporate event in Brussels and performed concerts in the Caribbean including one on the exclusive island of Mustique. Highly Strung’s clients include John Lewis, the Ministry of Defence, Mercedes-Benz, Boots, the RAF, Capital One, HSBC, Proctor and Gamble, English Heritage and the BBC. Individual members of the string quartet have played with the Royal Philharmonic Orchestra, the Royal Liverpool Philharmonic, the Halle, BBC Philharmonic, the Northen Sinfonia, the Detroit Symphony Orchestra (USA), the BBC Symphony Orchestra, the London Concert Orchestra and the Johann Strauss Orchestra, the Orchestra of St Johns and the Orchestra of the Swan. They have also performed in concert, on tour and on television alongside Will Young, Shakira, Rod Stewart, Il Divo, Robbie Williams, Simply Red, Procol Harum and Elton John. Highly Strung Quartet is a reliable, sophisticated choice for your event. Some of their more modern pop repertoire has been specially arranged for the quartet and is unique to Highly Strung. If there is a song you would like arranging specially for your wedding or event, Sarah can arrange this for you. The Highly Strung String Quartet predominantly takes bookings for weddings in the East Midlands. Areas include; Nottinghamshire, Derbyshire, Leicestershire, the Vale of Belvoir, Rutland, South & West Lincolnshire, Northamptonshire, East Staffordshire, South Yorkshire, Birmingham and Warwickshire. Sarah Huson-Whyte by email at sarah@highlystrungquartet.com or phone 07967 361717. (You can download the demo tracks from this site by clicking on ‘Demo CD‘).